Want to test drive this product before purchasing a gallon or more? 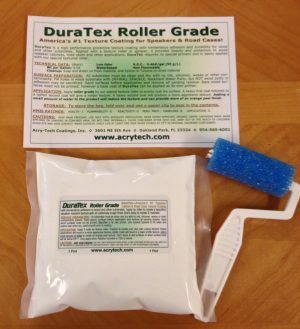 Acry-Tech now offers a Trial Size bag (1 Pint) of roller grade and a 3″ roller for $29.00 (including shipping). 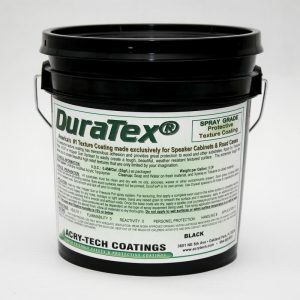 Check out our DuraTex® Trial Size Kit that will give you enough DuraTex® to coat a couple 12″ speaker cabs. 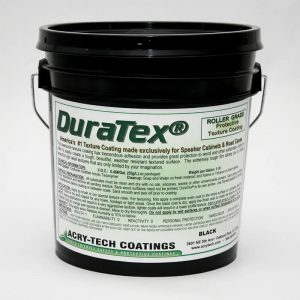 We’re also now offering DuraTex® in a Quart Size s as well that comes with a 3″ roller for $40.50 (including shipping). This size is perfect for projects that require more than the Pint Size Kit but less than one gallon. Purchased this product for some large PA style garage speakers I built. This is probably the best roll-on product I have ever used. No scent, dries fast, cleanup is a breeze and the texture with the roller they provide (separately) is perfect, it looks as though it is sprayed on. One gallon will also go a very long way. I was able to cover four cabinets (two each – 22"H x 28"W x 18"D and 42"H x 15"W x 17"D) with two heavy coats and used less than half a gallon. Very durable as well, HIGHLY recommended. Two words – freakin’ awesome! I can’t count the number of cabinets, new and replacing that old nasty fuzzy carpet (actually increase value of some refurbs I’ve done), and other projects I’ve used DuraTex on – I even rolled it on a bed tool box and hard tonneau cover I built for my truck – Looking good after Texas summer heat and now ice and snow without a crack or fade yet – if it ever needs a touch up it’s a just a few roller strokes away. Don’t think I’ll ever go back to flat black paint or carpet again. Only wish it came in colors – an olive drab and dark green (love to do do a camo look), medium gray, navy, a dark burgundy maybe ? Water clean up and tough durability make it a great product! 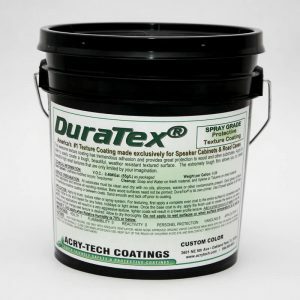 I purchased the Dura Tex speaker coating trial size kit. I resurfaced my 15" cabinets with it! They look brand new!! Its better than described!! They once again look the way they left the factory! This stuff is super fun and very easy to work with. Just be sure to follow the instructions and prep all the surfaces correctly before refinishing. Beyond that, low humidity and hot temperatures really help this stuff work its magic. It tacks up quickly which means jobs can be done in a day or two if necessary. Great stuff am doing a boat load of speaker cabs, if all runs good, next it will be my Mother-in-law!! !